Origin and Habitat: South-west Mexico, Oaxaca, between Nejapa, Juquila, Mixes and Lachiguiri. Altitude: 2000-2300 metres above sea level. Nabitat: It grows in barren rocky soils in open pinion forest often embedded in humid moss patches on large exposed rocks. Other plants found in this area comprises: Agave lophantha and Tillandsia pueblensis. Description: Mammillaria deherdtiana is a compact globe-like plant with large, deep-red flowers that originates from the high mountains of Oaxaca. Plants are solitary. Two subspecies are recognized, the nominate and ssp. dodsonii (Bravo) D.R.Hunt. The distinctions between the subspecies are somewhat ambiguous and even if it appears that there is some geographic separation between them, field studies have established a seamless transition between Mammillaria deherdtiana and M. deherdtiana ssp. dodsonii. The standard M. deherdtiana has more numerous spines, usually including 1 or more straight, reddish-brown centrals. Both M. deherdtiana and M. deherdtiana ssp. dodsonii are wonderful, large-flowered and with attractive spination, but fairly slow growing. They flower in summer. Stems: Solitary, depressed globose, to 2-5 cm high and 4.5-5 cm in diameter. Roots: Thickened fibrous from the basal portion of stem, but lacking the tuberous tap root. Tubercles: Conical, up to 19 mm long, dark green, in 8 and 13 spirals with watery sap. Axils slightly woolly or naked. Areoles: Obovate, 4 mm long and 2 mm. wide, covered with pure white felt, , set obliquely at the top of the tubercle. In the case of new areoles the upper half bears minute reddish brown deciduous bristles. Naked or with traces of white wool. Central spines: 1-6, sometimes absent, fine, needle-like, nearly erect, reddish brown to yellow, 3-7 mm long. The principal one slightly declined, stout, 3 to 5 mm long. *Radial spines: 20-36, fine, needle-like, yellow, becoming white, 3-6(-20) mm long.g, the upper ones slightly curved, the lower ones directed forward and occasionally curving laterally upward or downward, longer and stouter. Light yellow at first but soon passing to a glistening white with occasional reddish brown tips. Flowers: Long funnelform, opening widely, bright rose violet, to 50 mm in diameter. Floral tubes long, to 20 mm long, flesh coloured, with small olive green scales, the ovary embedded in the stem between the tubercles. Outer perianth segments up to 10 mm. long, lanceolate, flesh coloured on the margins and greenish in the middle. Inner perianth segments up to 23 mm. long and 4 mm wide, oblanceolate with acuminate tips, bright rose-violet, with a darker mid-stripe and tip. Style, longer than the stamens, white, flushed slightly with violet at the base and beneath the white mid-stripe and tip. Style, longer than the stamens, white, flushed slightly with violet at the base and beneath the white stigma lobes, which are four in number. Filaments erect, the same colour as the style; anthers egg yolk yellow. Fruits: Globose, 3 to 4mm. in diameter, half embedded in stems, white at the base, the exposed portion pale green, with the dried perianth persisting. *Seeds: 2 mm long and 1mm wide, dark brown to black and minutely pitted. Mammillaria deherdtiana Farwig: has 8-13 spirals of tubercles, more than 30 radial spines and only 3-6 mm long, usually including 1 or more straight, reddish-brown centrals. Distribution: between Nejapa, Juquila, Mixes and Lachiguiri. Mammillaria deherdtiana var. dodsonii (Bravo) Glass & R.A.Foster: has 5-8 spirals of tubercles; About 20 radial spines that are up to 20 mm long. Distribution: it is an higher-altitude plant from Sierra Juárez, Oaxaca. 2) Arias, S., Cházaro, M., Hernández, H.M. & Gómez-Hinostrosa, C. 2013. Mammillaria deherdtiana. The IUCN Red List of Threatened Species 2013: e.T151790A561803. http://dx.doi.org/10.2305/IUCN.UK.2013-1.RLTS.T151790A561803.en. Downloaded on 09 July 2017. 4) John Pilbeam (1999) “Mammillaria The Cactus File Handbook” Nuffield Press. 7) Acosta, S., A. Flores, A. Saynes, R. Aguilar & G. Manzanero. 2003. “Vegetación y flora de una zona semiárida de la cuenca alta del río Tehuantepec, Oaxaca, México”. Polibotánica: 125-152. 8) SEMARNAT. 2010. "Norma Oficial Mexicana NOM-059-SEMARNAT-2010, Protección ambiental-Especies nativas de México de flora y fauna silvestres-Categorías de riesgo y especificaciones para su inclusión, exclusión o cambio-Lista de especies en riesgo. Diario Oficial de la Federación". 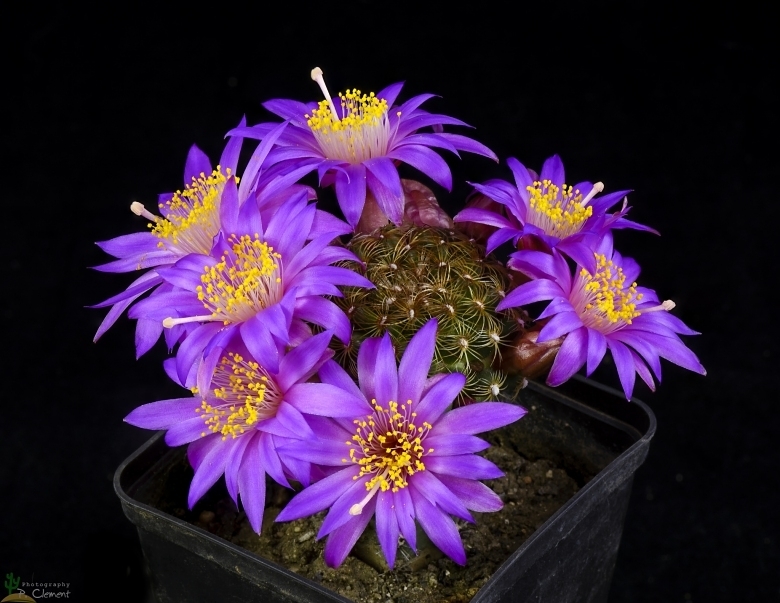 Cultivation and Propagation: Mammillaria deherdtiana is relatively rare in cultivation and has the fame to be difficult to grow on its own roots because it is very sensitive to overwatering (rot prone) and slow-growing. This species is adapted to very shallow organic soil (grows in moss patches) and requires skilful cultivation, but plants grafted on an hardy stock are easy to grow and no special skill is required. Growth rate: Slow growing species that will form irregular clumps with time. Flowering 3–5 years from seed. Propagation: Seeds are quite difficult to germinate and a low rate of success. The seeds can be sown in pots of fine, well-drained sandy soil, any time during the spring when temperatures are warm. Cover the seeds with a fine layer of grit and water from below with a fungicide to prevent damping off. For the 1-2 weeks cover the pots with a sheet of glass/clear perspex to keep the humidity levels high. Remove the glass and replace it with light shade-cloth and mist once or twice a day for the next two weeks after which most seeds should have germinated. From then on mistings can be reduced to every second and then every third day as the little plants grow. Grafting is often used to speed growth rate and to create a back-up for plants in collection.